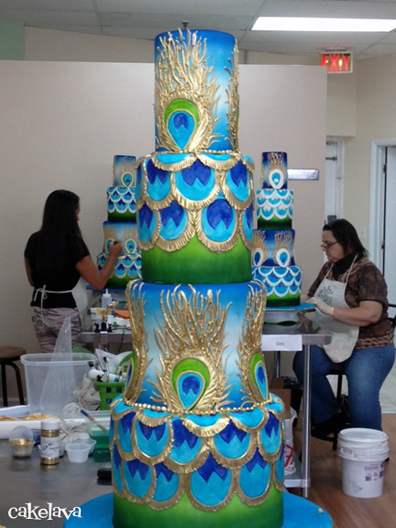 We're having a blast looking back on some of our favorite cakes from 2013 and hope you're enjoying the view! Today, we're exploring cakes made during the months of August and September, following the release of our book Extreme Cakeovers, A.E.C. (After Extreme Cakeovers). We'll devote some time to the eventful month of July and finish the last few months of the year in Part 4. Here is Part 1 and Part 2 of B.E.C (Before Extreme Cakeovers), if you missed the previous posts. 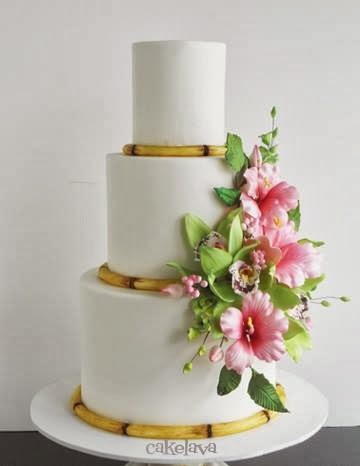 The cake (shown above) we chose to introduce this period of time was a 4 foot tall gold, pink, and white wedding cake. 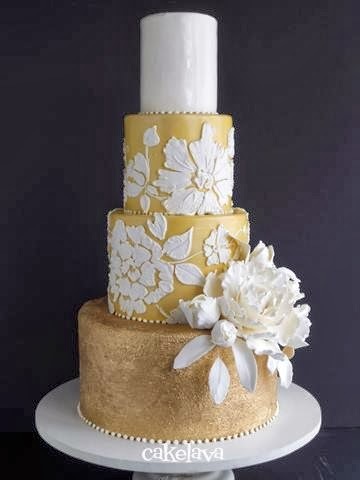 It was made in September and combines some trends and design elements we worked with prominently during this time - wedding cakes that were yellow or gold, beautiful handcrafted flowers, and towering, 3 to 5 feet tall. During the latter half of 2013, Rick was regularly dedicating many hours each week to making gorgeous handcrafted flowers. It was clear that romance was back, elegant and opulent designs were hot, and brides wanted to go bigger and more eleborate, and it kept us very busy! 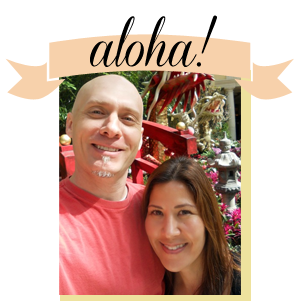 The morning of our book's release, Hawaii News Now's "Sunrise" show aired a segment with Rick and I talking about the book with Anchor Grace Lee. 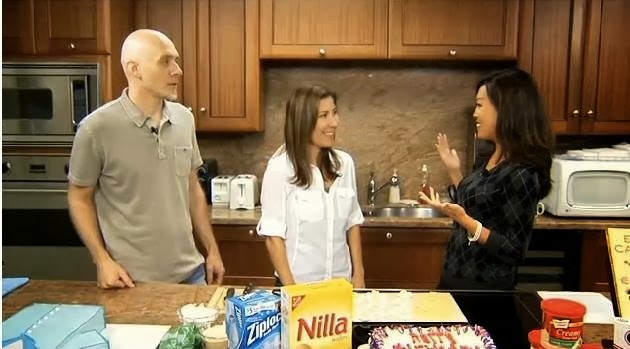 Rick demonstrated his Aloha Shirt cake in their studio kitchen. Click the link to watch the "Sunrise" TV segment. Like many authors, we "stalked" our book at the local Barnes and Noble and independent bookstores. 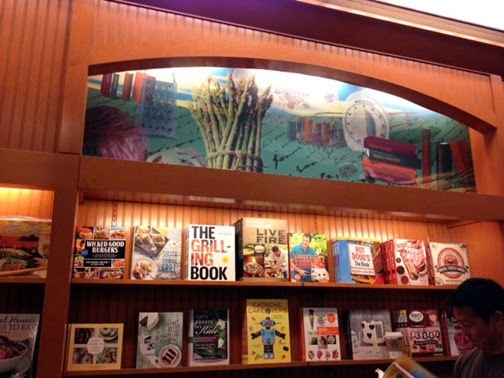 This photo was taken at the Ala Moana Barnes and Noble, where our book was displayed prominently. I can't explain what a rush it is to see your book on store shelves for the first time! 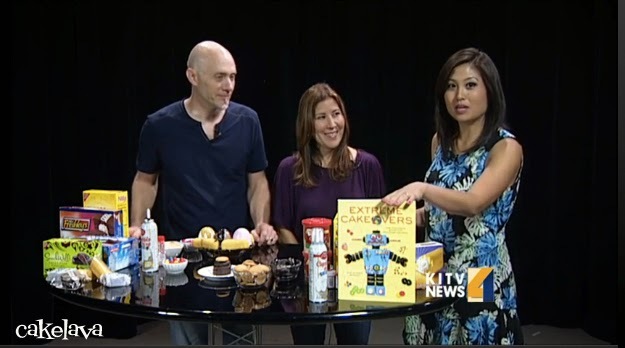 We filmed a segment at KITV, (ABC) which you can watch here. 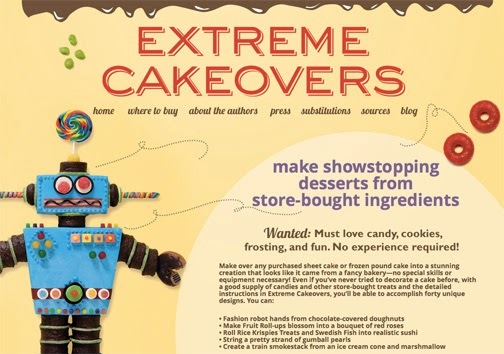 A special Apple only iBooks version of Extreme Cakeovers was released. It offers more interactivity than the other ebooks. 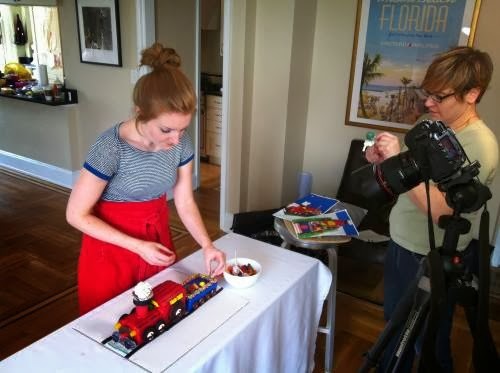 You can see the Behind the Scenes at the Extreme Cakeovers iBooks photo shoot on The Recipe Club's (Clarkson Potter and Ten Speed Press) website, and order the iTunes book here. The book has 40 cake recipes, all made from store-bought products. 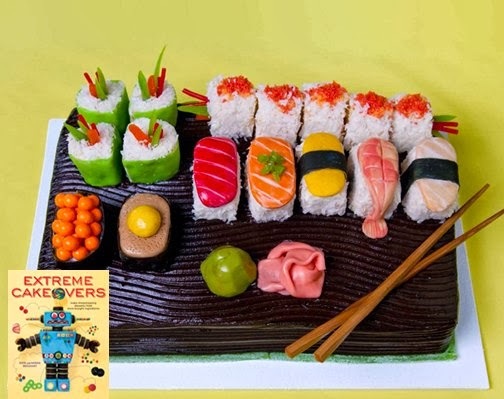 One of our favorites is the Sushi Platter cake. 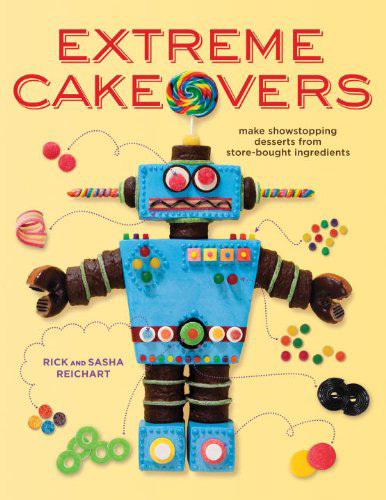 If you want to learn more about the book, check out the Official website for Extreme Cakeovers. 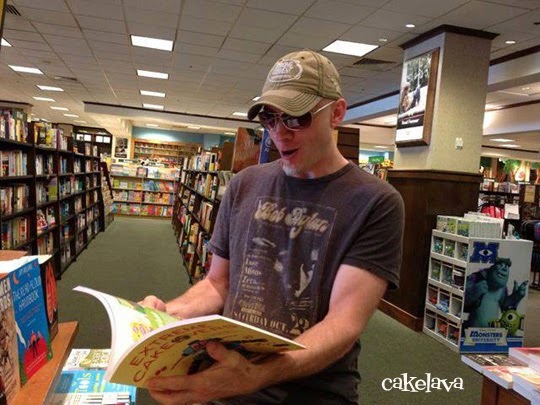 As if releasing a book wasn't enough, also during July, we flew to Boston for a week where Rick taught two cake decorating classes to students at The Cake World. It made for an eventful month and a nice break from making cakes! Shortly after returning from Boston, we posted about our experience and a number of photos taken during the classes. You can see it here. In Part 2 of our review, I mentioned one of the trends was requests for "incredibly complex sculpted vehicles"(air and land). I'll add, sea vehicles (like a fishing boat) as well. This Monster Truck was made for Stylen's birthday. The entire body and its gigantic wheels were sculpted out of cake and the decorations were handmade and painted by Rick. 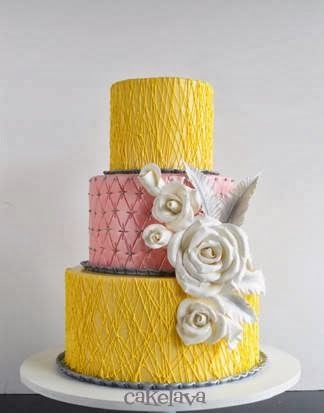 We adored the yellow and pink wedding cake Rick made for Chelsea and Kyle in August. They wanted a lot of texture in their cake so Rick designed the cake where all tiers had texture and added handcrafted feathers and large roses, which were also on the bride's dress. Here is another yellow wedding cake Rick made, just two weeks after Chelsea and Kyle's yellow and pink wedding cake above. Sarah and Pat's yellow ombre wedding cake with gold accents was inspired by the bride's pretty plumeria flower jewelry and the groom's gold cummerbund. It was a military officer's wedding and the couple cut the cake with a sword. The cake was a huge hit at the wedding and when it was posted afterwards. 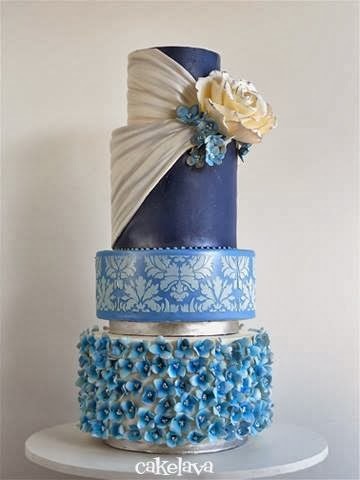 Though we did a fair amount of yellow toned wedding cakes, we made an all blue cake too! One of our favorites of the year, this pretty blue cake was made by Rick for Dara and John, a couple we first met years ago. 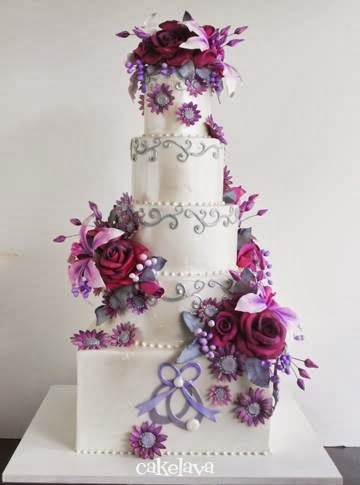 The flowers were handcrafted and took many hours to make - the whole bottom tier was covered with them and more flowers on the top tier! The Rainbowlicious cake made for a stunning cake cutting! You know it's a fun week when you get to make a cake as cute as this! Rick made the cake in late August for Chase's first birthday. 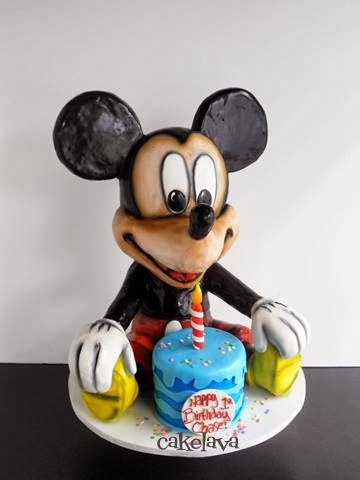 Both the mouse and cake in front are made of cake. On top of it being a difficult to sculpt, the baby's father is a celebrity and that always adds more pressure. He and his wife were so kind and appreciative when we delivered the cake. We left the party feeling great, and relieved the hard work was behind us! Kiran and Perdeep's wedding cake was delivered the same day as Chelsea and Kyle's yellow and pink wedding cake. I recall the week when Rick spent about 8 hours making all the gorgeous roses for the cascade. It looked amazing! The bride and groom were overjoyed with the cake and we thought it turned out beautifully! 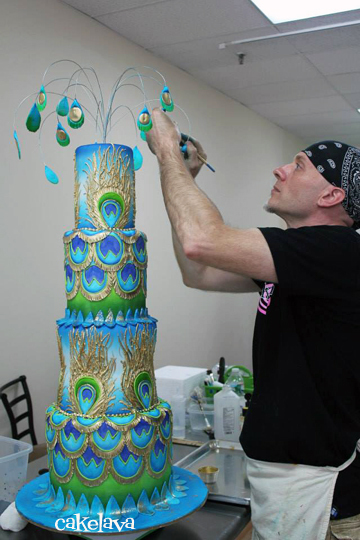 Brandie and Glen's wedding cake was made the same weekend as Dara and John (blue) and Shanell and Troy's, (shown below). Rick started working on the flowers at least a week before the weddings just to have them all done in time! We previously worked with Brandie and Glen on their twin boys birthday cake and now it was their special day and we were excited to make their wedding cake. Rick's cake design for the couple combined squares and round tiers and pretty purples with silver accents. On the bottom tier was a pair of wedding rings tied with a ribbon. 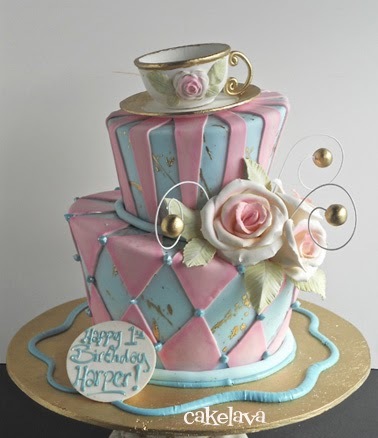 The cake was so lovely and we enjoyed working with our clients again! 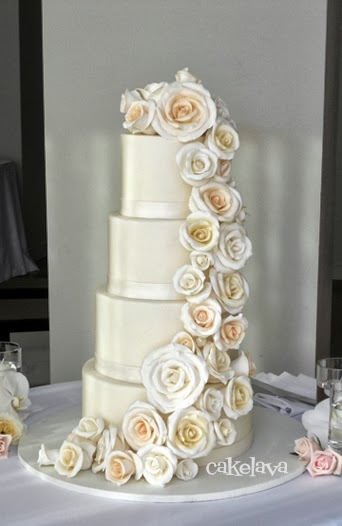 We're starting and ending Part 3 of our Review with a 4 foot tall wedding cake. 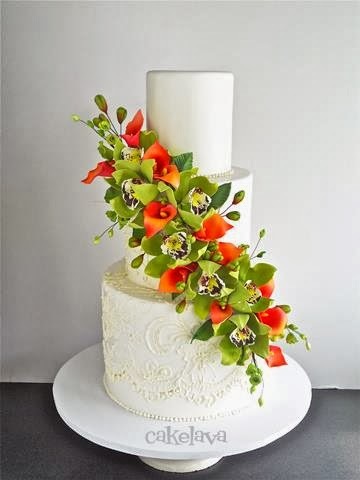 Shanell and Troy's wedding cake was one of three elaborate floral wedding cakes made in a single weekend. Rick had his work cut out for him! 24 hours were spent making this one cake! 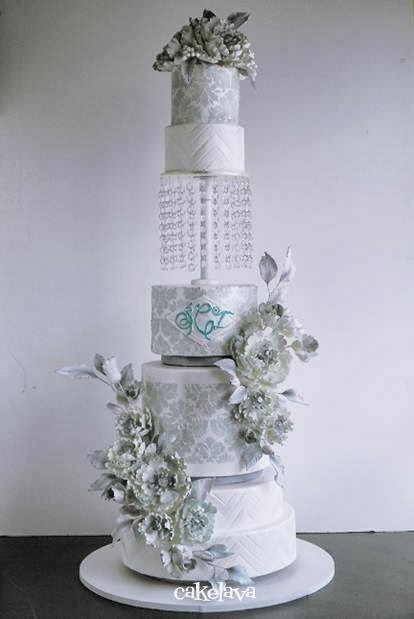 For Shanell and Troy, Rick designed their cake to be covered in patterns, with bunches of large, delicate flowers. The main colors were grey and white with a vintage feel. The couple had a "TRON" themed lounge for their guests during the cocktail hour, and Rick added their monogram in a turquoise blue color, to tie in the bride's area with the groom's. We were intrigued with vintage elegance reception room and TRON inspired cocktail lounge. Sounds like a fun wedding! 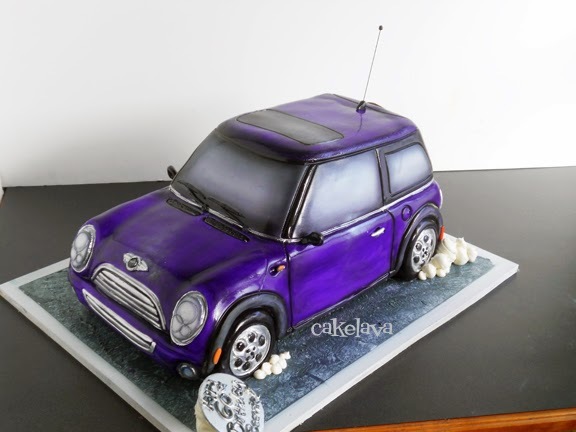 In our next post, we'll wrap up 2013 with more cakes - more cars, some awesome sculptural compositions with custom figurines and of course, more wedding cakes! Please feel free to share with us your thoughts. Thank you for taking the journey with us! We continue with B.E.C., Part 2 of our 2013 Year in Review. If you missed Part 1 of our retrospective or are asking "What's B.E.C stand for? ", you can catch up here. 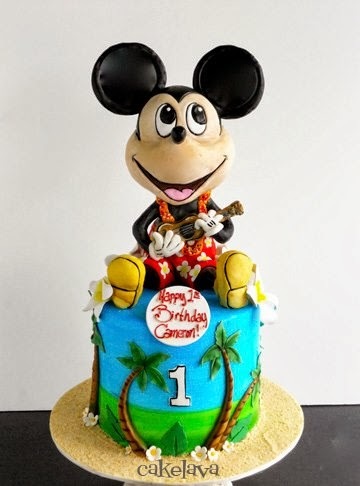 You may have noticed a number of ocean/beach themed cakes in Part 1. 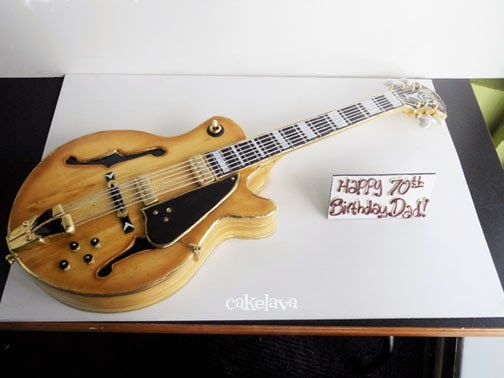 As is often the case with cakes, trends emerge and suddenly Rick is making cake after cake with a similar theme. In the first half of 2013, for some reason, we had plenty of ocean themed cake requests. 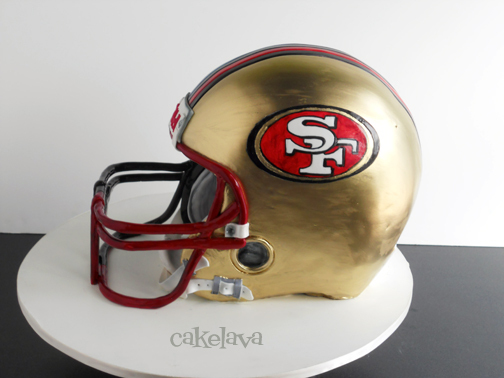 One of our favorite cake projects in that theme was an antique copper sculpted diver's helmet. 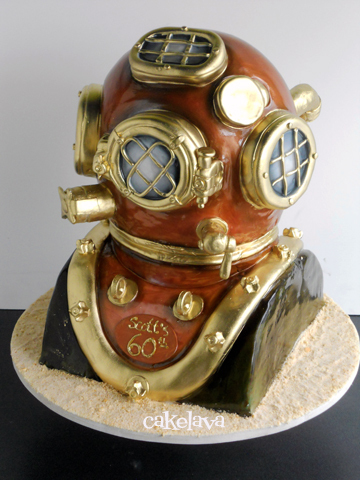 Making an antique diver's helmet was on Rick's cake bucket list - he's always wanted to make one - so we were both excited when our client ordered one as a surprise 60th Birthday cake for her husband. 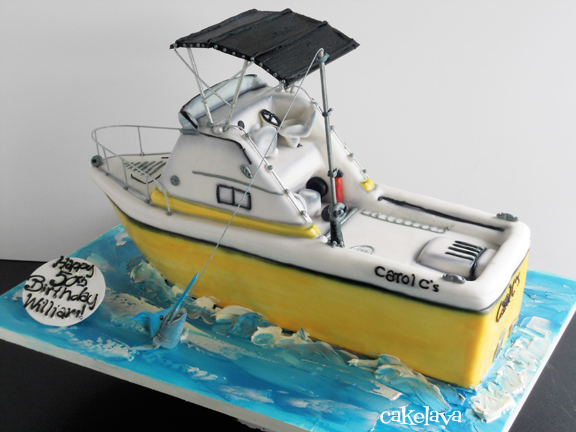 Rick made this yellow and white sculpted fishing boat cake for William's 50th Birthday. It came as no surprise the cake was yellow, as were many cakes we made that year. Like the antique diver's helmet, the fishing boat wasn't easy to make and was ordered by a woman for her husband's surprise birthday party. Both clients and their husbands were thrilled with the cake and it was a hit at the party, which made us very happy! 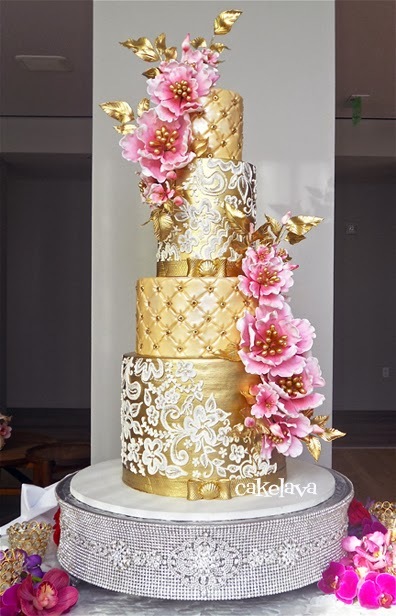 The two cakes above, a wedding and groom's cake, made for Grace and Dallas represent two more cake trends we noticed at cakelava in 2013 - yellow and or/gold colored wedding cakes, and incredibly complex sculpted vehicles (air and land). For Grace's wedding cake Rick did a freehand floral applique inspired by the bride's dress, a textured gold bottom tier and gorgeous handcrafted peonies. 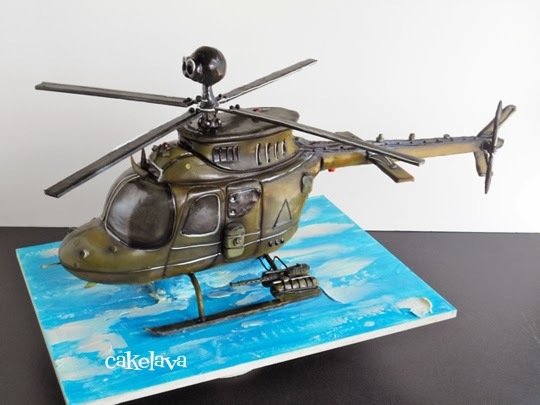 The groom's cake, a badass Kiowa Warrior helicopter for a pilot was as masculine as they come, and looked perfectly at home at the military wedding. 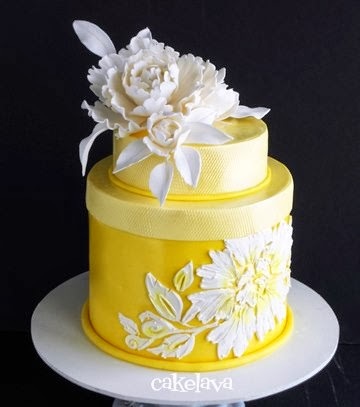 Another beautiful yellow wedding cake. 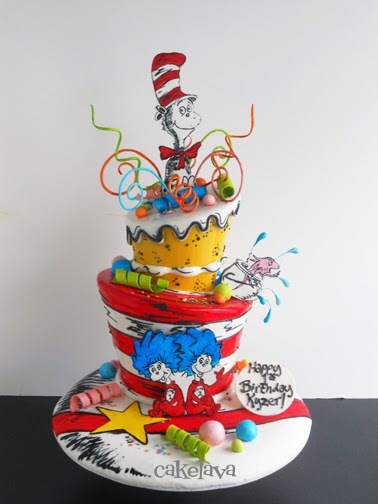 This cake was actually inspired by Rick's 3-tier "Joy" design, and redesigned as a 2-tier. We love both versions! 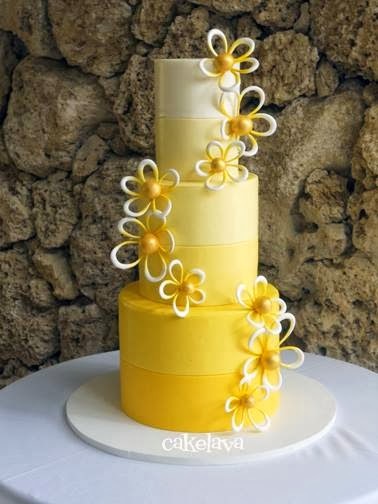 Stay tuned for more yellow wedding cakes in our next posts. 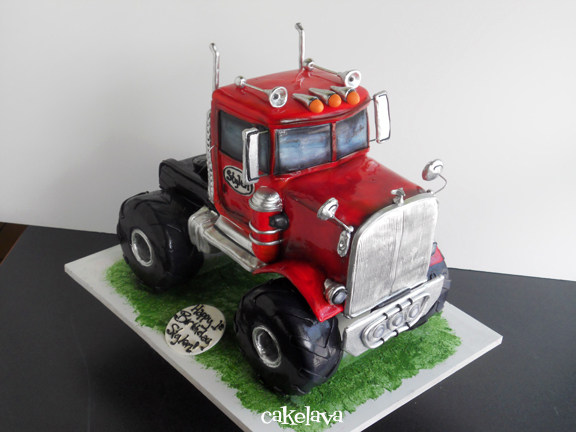 Another sculpted vehicle cake, though this guy needs no introduction. It had been a while since Rick made this car and he enjoyed revisiting an old friend! 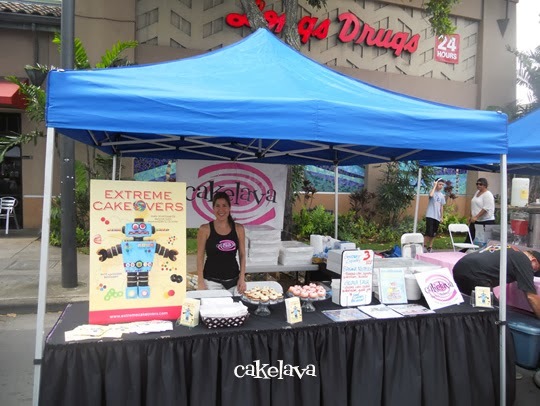 Our shop hasn't offered cupcakes in years, but in April Rick baked his mouthwatering Guava Lava and Banana Nutella cupcakes for the "I Love Kailua Town Party", a benefit for the Lani-Kailua Outdoor circle which helps keep our lovely hometown green and beautiful. We were happy to donate for a great cause! It's been a while since we've had a booth at the annual Kailua Town Party and we enjoyed mingling with our community (and the tens of thousands of attendees). Rick snapped this photo of me in our booth, standing next to a giant poster of our book cover, a special gift from our publisher! Though the cupcakes were thoroughly enjoyable - we ate several of them - it's a good thing we're not around them too often. They are too irresistible! 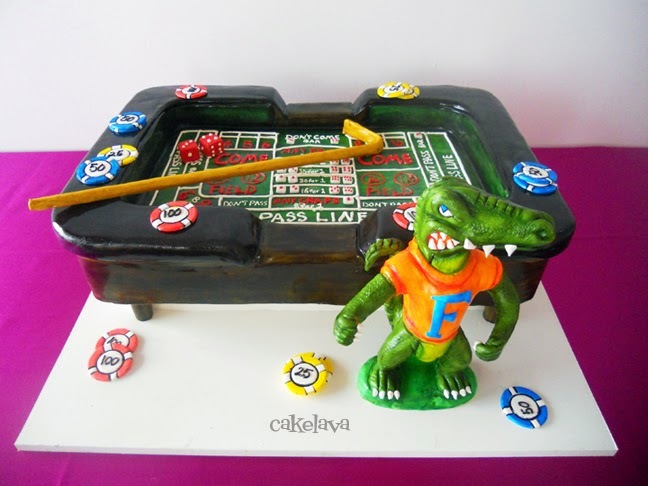 We had wondered when we were going to get a request for a sculpted Craps table with a Florida Gator and 2013 was our lucky year! It was one of our more unusual cakes of the year and we were so happy to do it, along with the couple's lovely wedding cake! Rick spent a good amount of time making the Gator figure and sculpting the cake. Our bride Marnie ordered the Craps table for her fiance Chris as a surprise groom's cake presented at their rehearsal dinner. 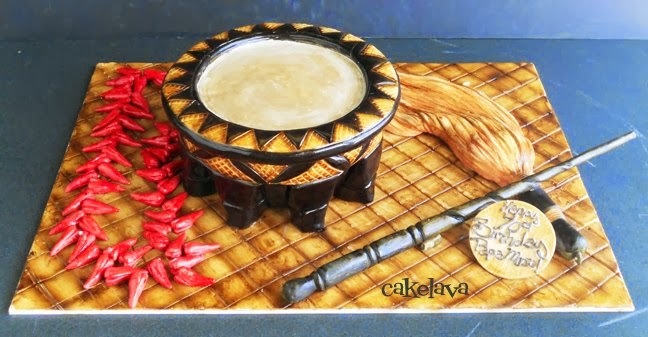 Another cakelava first, a sculpted Samoan kava bowl. Rick included handcrafted traditional Samoan decorations worn and used by the chiefs, in honor of Papa Mose's 70th Birthday. We're ending Part 2 of B.E.C. with a cake Rick greatly enjoyed working on. wink. This NFL team and its iconic cheerleaders are instantly recognizable. 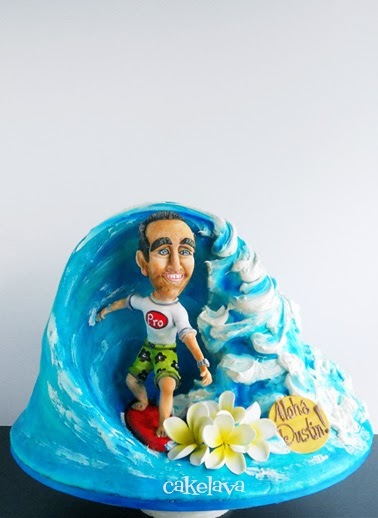 The sculpted figure, a surprise gift from his wife, was made for Jeff's birthday party at a local steakhouse. 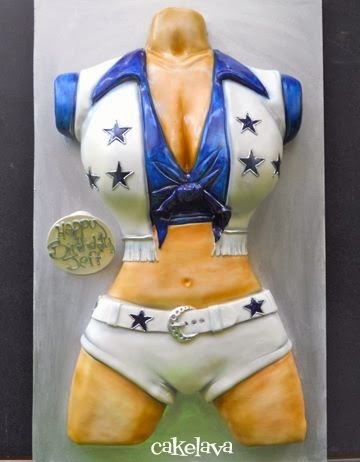 Great steak and a Dallas Cowboys Cheerleaders themed cake - a birthday meal that would make so many men jealous! The selection of cakes in Part 1 and 2 of B.E.C. (Before Extreme Cakeovers) were made by Rick in January to June. In the next post, we'll share some of our adventures in July including the book's release and our Boston classes, and then look at Part 3 - cakes made A.E.C. 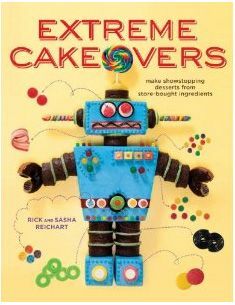 2013 was different than any other year in our lives because it was the year our first book, Extreme Cakeovers was released. The book was released on July 9th in stores everywhere. We knew it would make for an especially hectic year since we were still making cakes for cakelava during the other 11 months. 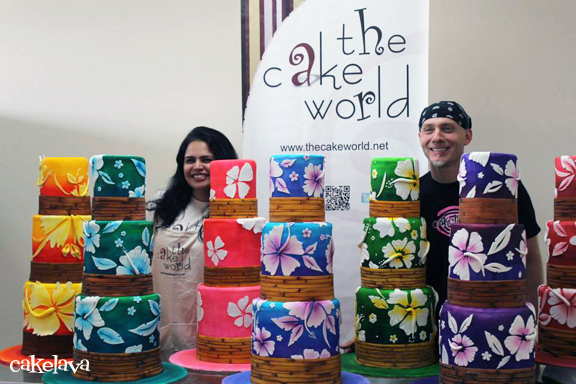 In July, in addition to our book commitments, we flew to Boston for a week, where Rick taught two cake classes at The Cake World. Because the book brought such a frenzy of excitement and anxiety to our year, we referred to the months before July as B.E.C. (Before Extreme Cakeovers) and afterwards as A.E.C. 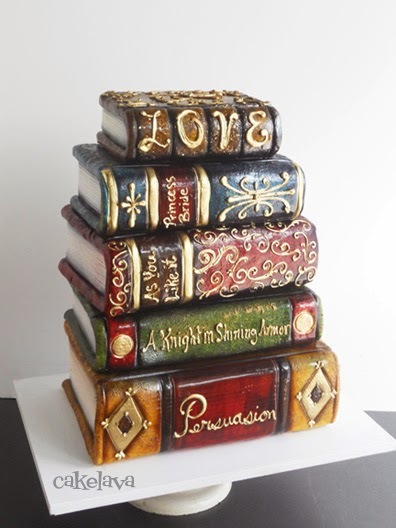 In addition to everything book-related in 2013, we were blessed with the opportunity to make some of the best cakes and most unusual designs Rick has ever done! We've included a selection of some favorites done in two groups of four parts - B.E.C., made in the months of January through June, and A.E.C., from August to December. 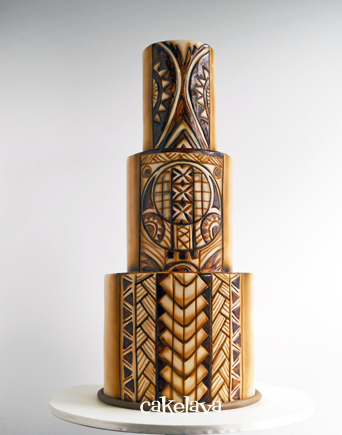 We often reminisce about the Samoan tribal tattoo wedding cake (photo above). The groom's tattoo inspired Rick's design, which he hand painted freehand and airbrushed. 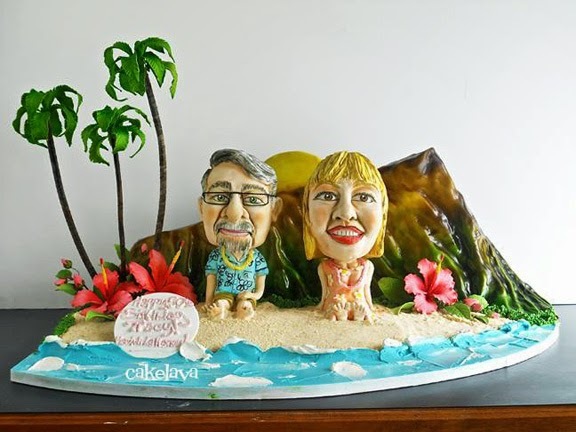 Making a fondant covered cake with ruffles that look like torn pieces of fabric in the Hawaiian humidity is no easy task, but we had a bride that desperately wanted one and Rick decided to take on the challenge. 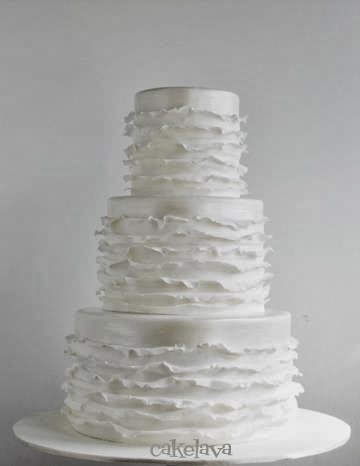 The cake looked delicate and beautiful in person and was a nice change for us to do an all white cake. 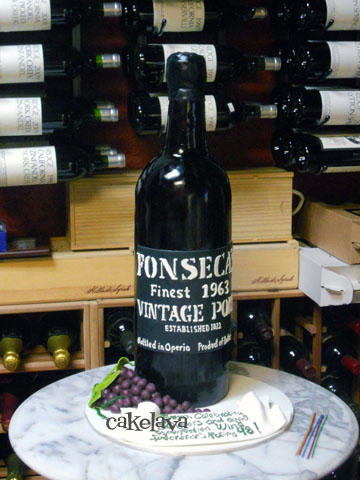 Sculpted Fonseca vintage 1963 Port bottle birthday cake. It looked right at home in the wine cellar nestled amongst the other bottles. The cake looked so realistic, it fooled many of the guests! 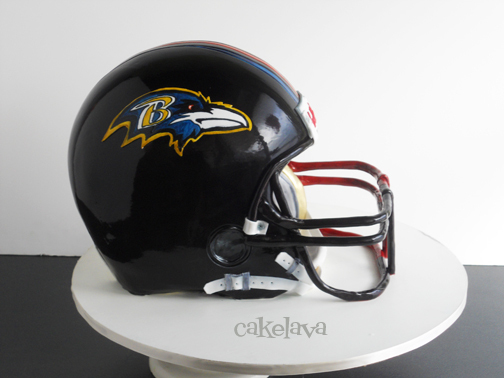 There is a beautiful, touching story that accompanies these two football helmets made for a Super Bowl party. Our client ordered the cakes for her birthday and decided to have them donated to a local emergency shelter for the teenagers to enjoy during the Super Bowl. We were thrilled to deliver the good news (and the cakes!) to the Shelter on behalf of our client, who requested her gift to remain annonymous. 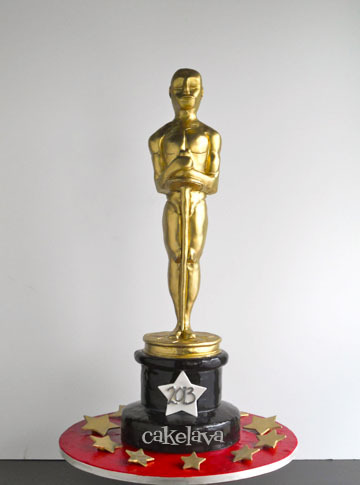 Our first cake of it's type and made for a special client of ours to share with her family at their Oscar's party. Read the backstory on the cake and it's delivery here. 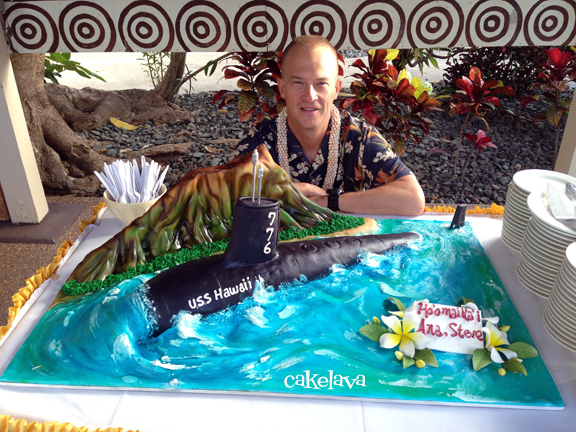 Rick made a sculpted USS Hawaii (SSN 776) with Diamond Head in the background, for Cmdr. Stephen Mack's Change of Command Ceremony. The cake was a huge hit at the event and upon delivery, his wife presented us with a very special coin, which you can see here. 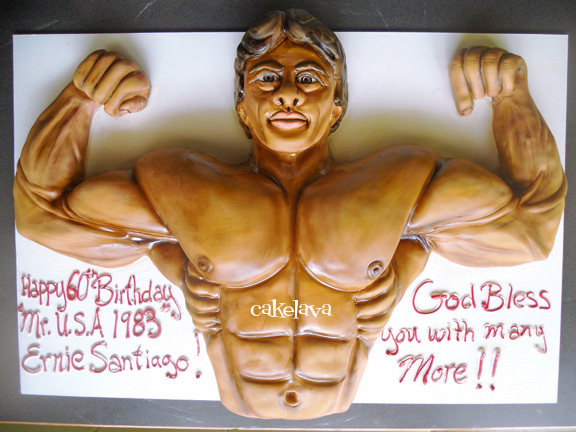 We adore our clients the Santiagos and were so honored when they asked Rick to make Ernie's 60th Birthday cake, a sculpted bust of Ernie as Mr. USA 1983! Read the full story and see photos of the man in action past and present here. 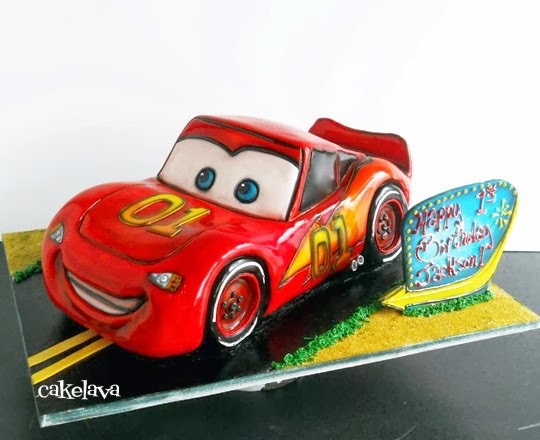 We've made cakes for various family members of these clients for years and were thrilled when we were contacted right after Cameron was born, so they could book his first birthday cake! 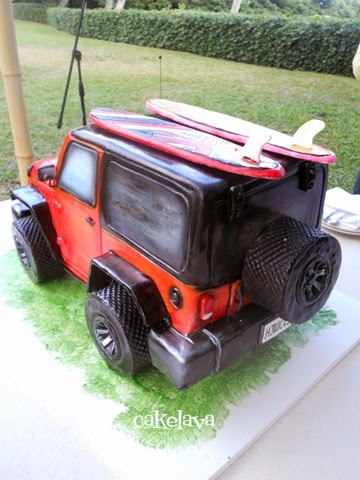 When we heard what the theme was and that they wanted to add a Hawaiian touch, Rick couldn't wait to make their cake! We thought it turned out so cute! Like several of the cakes above, we made the mermaid with a sculpted treasure chest for one of our regular clients who were celebrating both their son and daughter's birthdays together. 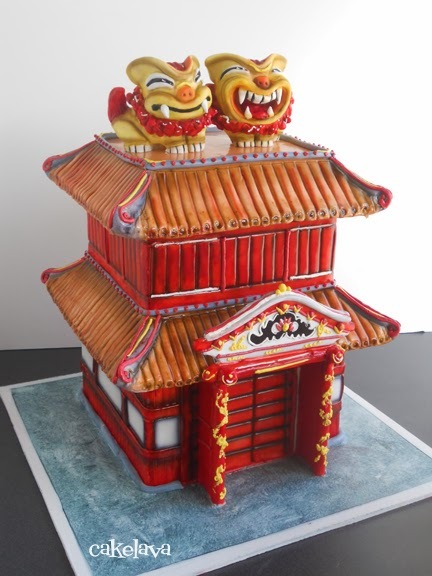 Our cake making history with the couple started with their 3 foot tall wedding cake and a spectacular groom's cake. 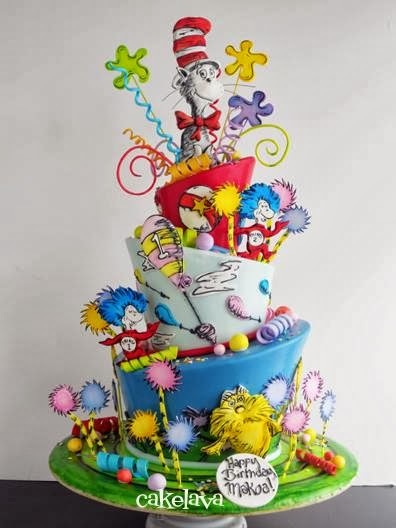 We've been making cakes for them ever since! 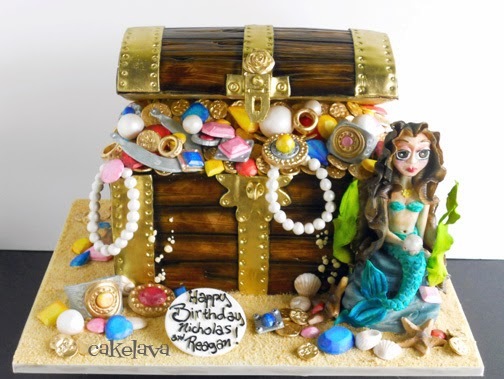 The treasure chest was sculpted cake and all jewels and the mermaid were handmade. The cake took a ton of time but was oh so worth it! Another ocean themed cake made B.E.C. 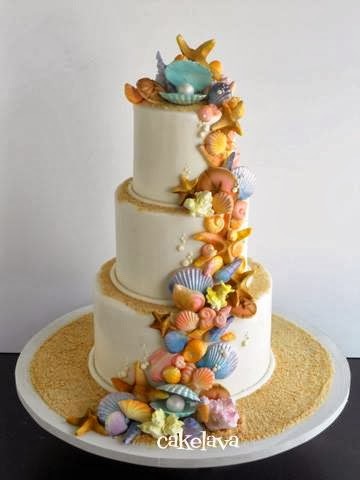 was this striking cascade of colorful edible shells. Rick made the cake for a Sweet 16 beach themed party. 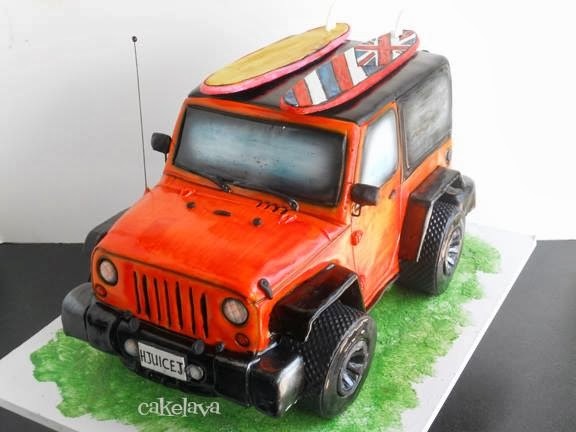 In Hawaii we're surrounded by ocean and get a fair amount of requests for cakes in that theme. This was Rick's first scuba diver looking into a cave birthday cake. 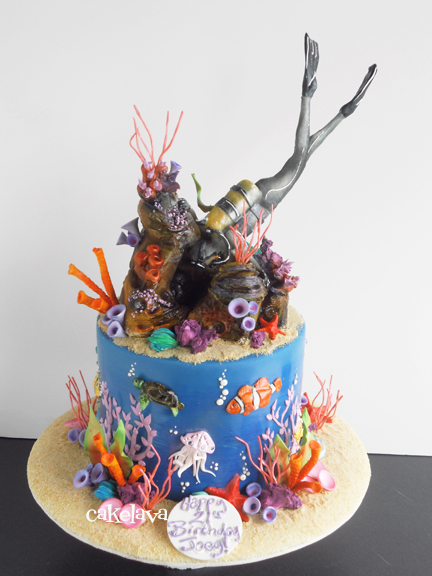 The cake was ordered as a gift to a marine biology major who loves to scuba dive. 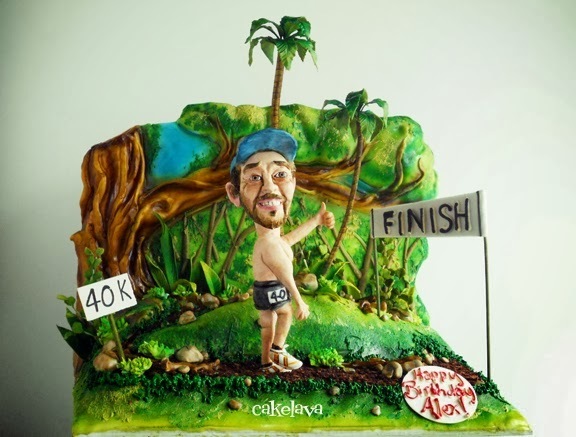 Every piece on the cake was made by hand and Rick estimated 4 to 5 hours were spent just on the diver and cave. On our next post, we'll explore Part 2 of 2013 B.E.C. We have many more fun cakes to share!